After two days and more than 370 miles around Circuit de Catalunya in Spain, Valentino Rossi recorded his fastest lap time in the F2008 he was testing with Ferrari, a 1:21.9 on his penultimate lap. That’s just off the lap record of 1:21.67 set by former Ferrari driver Kimi Raikkonen in 2008. “We kept the last three quarters of an hour to try a ‘time attack’ with little petrol and fresh tires. I would have given anything for such a lap time,” said Rossi, the MotoGP champion. According to both Rossi and Ferrari, the test was a reward for winning the MotoGP title last year — his ninth. As rain hampered the first day’s morning session, the second day began under heavy fog, reported Ferrari. But the sun appeared and the track soon dried, allowing Ferrari technicians to outfit the car with slicks, which led to increasingly quicker lap times. The test car was the F2008 that Ferrari used to win the constructors’ title two years ago, though equipped with Bridgestone GP2 tires, per new Formula One regulations. “We tried different set ups and he improved a lot: this means that the driver learns quickly and has room for improvement,” said Luca Baldisserri, Ferrari’s sporting director. 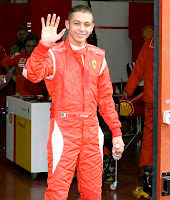 This is Rossi’s sixth test in a Ferrari Formula One car. He compared the experience with his last bit of seat time in the F2008 at Mugello Circuit back in Nov. 2008.